Based on the All Souls trilogy by Deborah Harkness, A Discovery of Witches is a new television series is about “daemons,” vampires, and witches that co-inhabit the world alongside ordinary humans. Each group distrusts the others. in the first episode, one of the characters notes that the world has become a time of “men,” echoing the progression of Tolkien’s Middle-Earth. The other groups have faded into the background, but still exist – vampires, daemons, and witches – oh, and a regulation board. Sky’s new series hits the screen with two important backstage successes. First, A Discovery of Witches was filmed in Wales at the newly-opened Bad Wolf Studios, created by former Dr. Who producers. Second, it is replete with Oxford University and Cardiff scenery, but also has amazing scenes within the Bodleian Library. For bibliophiles, the series is worth watching, if for nothing else than the scenes of Oxford University’s iconic library. Some of the scenes of the Bodleian (though reconstructed on magnificently detailed sets) are intimate and delicious. The cinematographic triumphs don’t end there. Viewers are rewarded with scenes from Venice with detailed views of the canals and all the famous and intricate passages of the famous waterway network. There are a few other visual delights, but it would reveal too much to comment on them. It is enough to say that the scenic camerawork (and set design) is not only effective in setting the mood for the series but is itself stunning as an independent artistic work. The series remains faithful to the award-winning original book series. Harkness is herself a professor of history of science who has studied the history of alchemy and the occult, and she has woven such detail into her novels that recreating them visually was in fairly straightforward. As a historical fantasy, we see the same type of build-up present in other contemporary fiction of the same genre, but the addition of the conflict here is more personal, magical and wondrous than the historical treasure hunt of similar novels. Matthew Goode and Teresa Palmer in A Discovery of Witches, based on Deborah Harkness’s All Souls trilogy [SKY Productions]. The story follows the work of an academic, Dr. Diana Bishop (Theresa Palmer), who we learn is a professor of history at Yale University and one of the youngest tenured faculty in that university’s history. We quickly learn that she is a brilliant historian and that her specialty is the history of science, specifically the relevance of alchemy in the development of the natural sciences. We also learn that she is continuing her research by visiting Oxford, where she can access unique medieval texts. She is also a hereditary witch who is reluctant to embrace her lineage and her powers, which she unable to control. The other main protagonist is geneticist Dr. Matthew Clairmont (Matthew Goode), a professor of biochemistry and a stereotypically charismatic vampire. He is also at Oxford and is curiously leading a group of vampires who are all apparently connected to medicine and the life sciences. The series begins at Mabon, and we quickly get a sense of the main characters and their relationships to one another – not fully, but enough to know that some relationships are strained. There is complicated and difficult history between the groups of magical beings, all of whom who can sense each other’s presence. The main plot centers on a mystical codex that mysteriously appears in the stacks of the Bodleian and gets logged as missing. When Diana requests the book, it manifests, and when she opens it, a supernatural palimpsest begins flowing from its pages, marking her. From there we follow the journey of the characters in understanding the codex but also in developing the relationships they have with the each other. 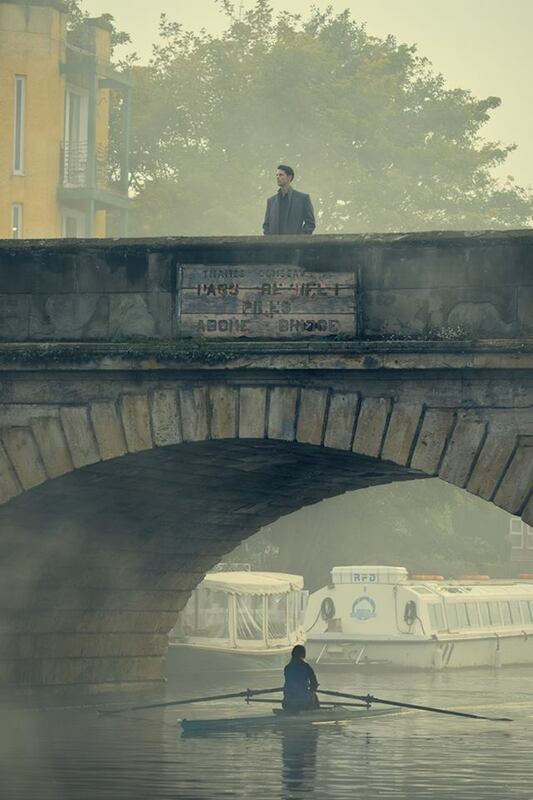 Bridge scene in Oxford from A Discovery of Witches [SKY Productions via deborahharkness.com]. Fans of similar magical and historical fiction will recognize many echoes of similar stories. The plot combines elements from the voyage of the magic-user hero archetypal stories like The Earthsea cycle, Dune, and Harry Potter, but it also adds tremendous detail to support the narrative – no doubt because of Dr. Harkness’ expert grasp of history and her exceptional skill as a story-teller. It does not take much to suspend disbelief. Sadly, the supernatural thriller is also a contemporary love story. Admittedly, I am biased against that kind of storyline – I still have trouble understanding why stories about women becoming powerful always seem to contain a Romeo-Juliet poison pill. The main problem with the romance is that it slows the pace of the series significantly. For a different viewer, that may not be distracting; for me, it just gave me time to enjoy the set. The eight-episode series premiered in the United Kingdom on Sky One in September and has already been renewed for two additional series, a comforting notice given the cliff-hanger at the end of first series. The first series has aired in its entirety in the UK and is now available on the Sundance Now and Shudder streaming services.